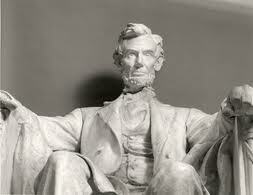 LIncoln as America's patriarch: the Lincoln Monument. 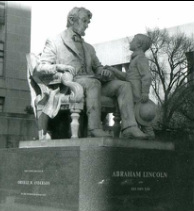 Lincoln with son Tad: the paternal figure. David Frye's 'Sick Semper Fidelis' - a modern interpretation of Lincoln. 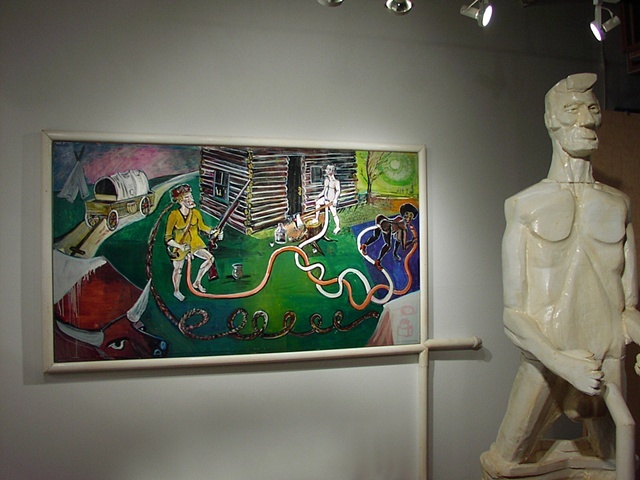 Lincoln has been depicted in countless paintings, sculptures, art installations, works of fiction, historical analyses and articles, and many biographies. Unsurprisingly, America's most famous president has also been portrayed in more than two hundred movies and TV features, starting as early as 1908. Yet only a handful of feature films have meaningfully examined his life and career. (Abraham Lincoln, Vampire Hunter doesn't count). Two of these films have been made by great American directors - D.W. Griffith and John Ford. Steven Spielberg has now followed in the footsteps of these two icons of movie-making with his movie about Lincoln during the final months of his life. Griffith's Abraham Lincoln was made in 1930, at end the very end of the famed director's career. Ford's Young Mr Lincoln was released in 1939, perhaps that director's most prolific year -he also made Stagecoach and Drums Along the Mohawk - during that period. 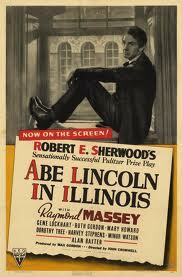 Abe Lincoln in Illinois opened the next year. 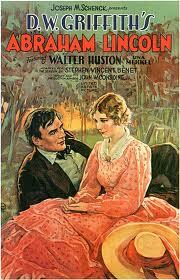 Its chief claim to fame was that it was based on Robert Sherwood's Pulitzer Prise-winning Broadway play and featured Raymond Massey as Lincoln, a role he repeated in other films and TV shows for decades. Each of these three movies emphasized different facets of Lincoln's character and political career. Click the above posters to go their respective Cliomuse pages. 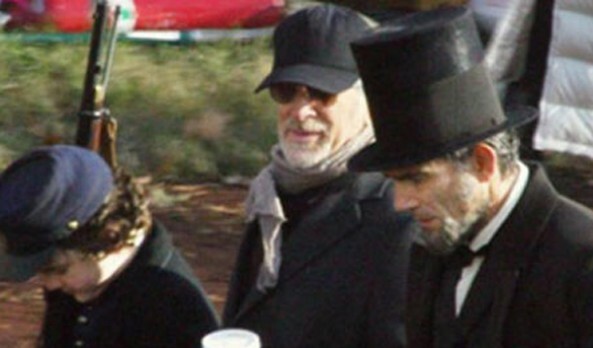 Spielberg on set with Daniel Day-Lewis as Lincoln. Day-Lewis with Lincoln beard but minus Lincoln-era hat and clothing. Spielberg has chosen not to be especially secretive about his screen version of Lincoln. However, two features stands out. First, the movie, although a biopic, does not cover the entire span of Lincoln's life, as Griffith attempted with only partial success. Not only does Spielberg avoid covering the same biographical terrain explored so effectively by John Ford in Young Mr Lincoln. 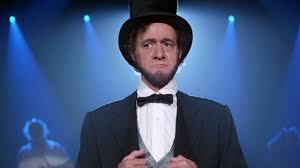 Spielberg's Lincoln is quite deliberately set at the final stage of Lincoln's life, not his formative years. The director was greatly impressed by the historian Doris Kearns Goodwin's book Team of Rivals: the Political Genius of Abraham Lincoln, a title which hardly suggests a Spielbergian focus on battles. Spielberg's movie focuses on Lincoln's struggle to completely end slavery by passing the 13th Amendment through Congress before the civil war ends, and what this reveals about Lincoln's personality and ideals. And the movie's scriptwriter Tony Kushner revealed that the movie focuses on "the political collison of Lincoln and the powerful men of his cabinet on the road to abolition and the end of the civil war", as well as on the last months of Lincoln's life. This approach carries certain dangers. Everyone knows about the assassination. Lincoln's attempts to control the wayward members of his government, and his efforts to enshrine emancipation into the Constitution are undoubtedly of tremendous historical significance, but they are very difficult to dramatise. However, most critics agree that both writer and director have succeeded in carrying off their uncommercial and risky approach. 'Be excellent to each other!' is Lincoln's sage advice to the younger generation in the great time-travel comedy 'Bill & Ted's Excellent Adventure'. 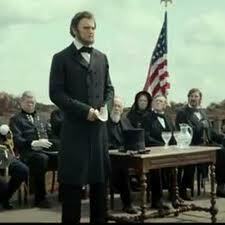 LIncoln takes time off his war against vampires to deliver the Gettysburg Address in 'Abraham Lincoln, Vampire Hunter'. Raymond Massey as Lincoln (again) in 'How the West Was Won'.